The last month here in Ã–strich-Winkel sure has been an exciting one, each day filled with all sorts of unique tasks and challenges. But overall, I can assuredly say that the knowledge I have acquired coupled with the stories and adventures that I have experienced have made this trip well worth packing up and leaving my comfortable old home in Louisville for five plus months! The weather here is not usually the best, it’s rained about 60% of the time, with temperatures rarely above 10 degrees Celsius — it’s usually very gloomy. According to many of the locals here, however, I’ve learned that this region, the Rheingau (Rhine Valley), is one of the warmest in Germany. It is ideal for vineyards, thus it is certainly true that there are vineyards as far as the eye can see. I live in Hallgarten, which is approx. 3 kilometers from the Schloss (Castle) Campus of EBS. It’s on a hill, so from my flat I can see the Rhine in all its beauty, along with the countless vineyards. Most of the days one of my flat mates or some French students with cars who also live in Hallgarten will drive me to school, but I have had the pleasure of walking a few times. It’s usually chilly outside…. alright freezing! But nevertheless, it’s very scenic. As you can imagine, the first week I was here was jam-packed with introductory activities. There are about 50 Tauschies (exchange students); we come from many different places: Canada, China, Korea, Uruguay, Norway, Chile, France and the USA. As planned by EBS, we took several trips. So far I’ve seen Wiesbaden, a very popular shopping district where I had the opportunity to try out my less than desirable German skills ordering coffee and Schnitzel, Mainz, where we saw the Gutenberg printing press museum and the only standing building in that area after WWII (a cathedral, spared because its sheer height served as a point of orientation for the pilots), Frankfurt, where we visited the Anne Frank museum and took a bus tour of the city, and good ol’ Oestrich-Winkel, the area where we live. The EBS took all of us out our first night to a nice Italian restaurant and bought us all food and drinks. It was amazing. Although they have quite a few problems with class scheduling and IT issues, they are very kind to their students. I feel very welcomed and at home here. I’ve made a lot of friends here, and we’ve taken several trips ourselves to varying cities. Koblenz was one of my favorite cities. There we walked along the river and saw monuments and buildings that were so architecturally amazing, they’re not even fathomable in the US. We saw the oldest church in Koblenz, founded in 836 AD. In 842 AD discussions took place within the church which eventually led to the division of the Franconian Empire–basically the establishment of Germany and France as separate entities. Basically, it was an amazing trip (even though we got lost on the way home!) Also, I’ve taken a trip to KÃ¶ln (Cologne), where I was able to visit Fantasialand!, the most amazing amusement park in Germany. I went with 3 other Americans; we rented an apartment for 2 nights and had an unbelievable time sightseeing and just learning about the area. My sister flew to Germany last week to visit me — that’s what happens when you can find flights as cheap as $400 on www.priceline.com! Fortunately, I had almost the entire time off of school, so we were able to travel to Berlin and MÃ¼nich, seeing relics of the wall that formerly divided the city into the Communist East and Democratic West and Castles such as SchloÃŸ Neuschwanstein, the inspiration castle for Disney’s Cinderella Castle, which is tucked away in the Bavarian Alps. We had an amazing time visiting all of these places. We spent last night in a Frankfurt hotel close to the Airport because my sister had an early morning flight back home. On Sundays there is only one bus that runs through Hallgarten, and it passes around 10:45-11:00 PM, so staying in Frankfurt was practically our only option. On a slightly more academic note…My classes are always a blast here at the European Business School, although I really miss the scheduling of U of L. We don’t have any two weeks that are ever the same, and classes sometimes run for a few days and others for a few weeks. It is important to daily check online to see where you’ll have to go next because of how frequently they rearrange the classes. I have very knowledgeable professors who teach outstanding lectures, although, some tend to be more outstanding than others (of course :)). I have enjoyed taking a Strategy Development class, part of a Strategic Management module, which includes parts of Business Ethics, Socio-Scientific Functions and Strategy Implementation — Adam Hanzalik and I take that class together and have been able to demonstrate a lot of the concepts we’ve learned from classes at U of L. I am also fond of my Family Business class, which has turned out to really allow me to critically think and analyze a lot of important factors in successful family businesses. I suppose the reason I like it so much is because of my interactions with my family’s business, Bowles Mattress Company . Surprisingly enough, Microsoft Excel is just as popular here as it is at the Business School at U of L — who would have guessed?! My Investments class is constantly referencing formulas and functions (the only problem being the lack of translation of German functions!!!) Also to my surprise, after a month of being in the country, I can speak a significant amount more of German than I ever expected. I’m not good by any means, but I can sure ask for a ride “nach Hallgarten” in the cold weather like none other! I believe I can attribute some of that good fortune to the amazing teachers at EBS’ language department. So as you can see, overall, great classes! It’s approaching 6:00 PM, and I have a few things I need to do to prepare for tomorrow’s lectures, so I should sign off now. Until next post, TschÃ¼ss! 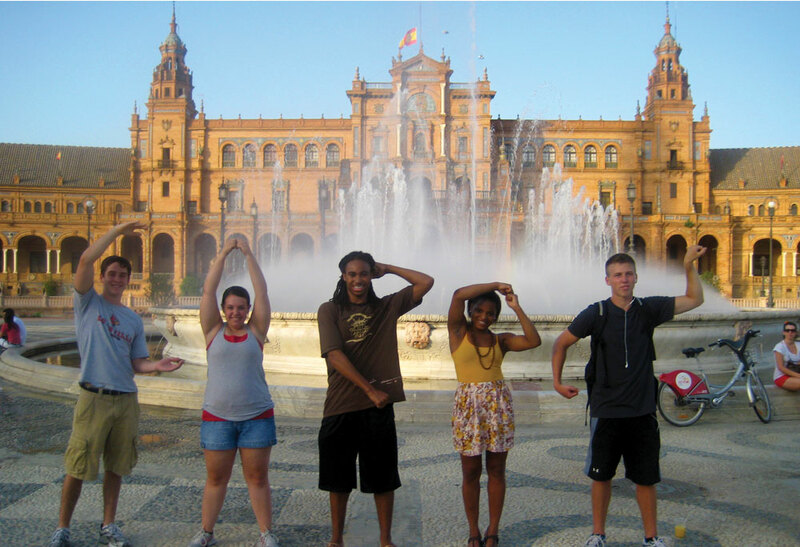 This entry was posted in Study Abroad by mdritt01. Bookmark the permalink.